Whether you’re hiking a ridge in Zion National Park on a scorching summer afternoon or an alpine trail outside Zermatt on a cool autumn day, proper hydration is a must. The problem is carrying enough water into the wild with you can be a significant burden. Each liter of water weighs more than 2 pounds and on a strenuous day long hike during the summer you may need to drink 4 or even 5 liters of water. Meaning you’ll have to carry 8 to 10 pounds of water. That much weight will turn an already arduous hike into a slog of Olympic proportions. What you need is a way to purify the available groundwater to protect yourself from the bacteria, protozoa and viruses lurking within, waiting to turn your intestines into jelly. What you need is one of our top 6 Best Portable Water Filters for hiking. Lots of hikers who appreciate today’s water filters don’t appreciate that some of them use chemicals to purify the water. They’re looking for what they consider a better way. The LifeStraw Water Filter provides that with their own Personal Water Filter. This personal water filtration device can clean up to 1,000 gallons of water for drinking without using iodine or any harsh chemicals. Another great thing about the LifeStraw is that there is no expiration date. Meaning that if you only use this portable water filtration system a few times a year it will still be there for you year after year until you reach that 1,000 gallon threshold. Removes 99.9% of waterborne protozoa. Weighs a scant 2 oz. Anyone who travels to some of the world’s more remote locations knows that even in some big cities the quality of the water coming out of the tap is suspect at best. Bring the LifeStraw with you wherever you go and protect yourself from salmonella, giardia, e-coli and more. Maybe best of all for hikers; it tips the scales at a microscopic 2 oz. Sometimes you just aren’t able to carry a large filtration device with you on the trail. Yet you still need to protect yourself from the scourge of waterborne bacteria and other menaces. The HydroBlu Sidekick 3-Stage Straw Water Filter answers the call of those looking for a compact, lightweight solution to the problem of obtaining clean water while hiking, camping or in the aftermath of a natural disaster. The HydroBlu Sidekick offers a comprehensive 3-stage mechanism for turning potentially dangerous water into something that is likely cleaner than what comes out of your tap. Removes more than 99% of waterborne bacteria. Protects you from giardia, e-coli, salmonella and more. Activated charcoal filter and cotton pre-filter. Waterborne bacteria are not the only hazard lurking in what should be fresh water today. Lead, nickel, chromium, zinc and other metals also get into drinking water by way of air pollution. Not to worry however, as the Sidekick 3-stage has you covered in this regard as well. 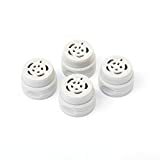 Large pieces of sediment can also be an issue if you are obtaining your water from a stream or pond so the Sidekick’s cotton pre-filter makes sure nothing larger than 0.1 microns gets through. The SurviMate Portable Water Filter is one of the best on the market today. While it’s a bit larger than some straw-style filters it’s nonetheless easy to use and is perfect for those who need to purify lots of water for a big group. The PRO will produce up to 2,000 liters of purified water. But at some point, especially if you’re using it to clean water for large family outings, the filter will eventually need replacing. When it does this Survivor Replacement Filter for the PRO Portable Water Filter is just what the doctor ordered. Each filter purifies up to 2,000 liters of water. Removes more than 99% of waterborne bacteria and protozoa. Removes lead, mercury, zinc, chromium and more. Eliminates unusual or foul tastes. Making sure the water you drink while you’re out hiking, camping or cross country skiing is safe and pure is essential. Likewise, when natural disaster hits safe drinking water is often in short supply. Make sure the water you and your loved ones are drinking is free of hazards both natural and manmade by having plenty of Survivor replacement filters on hand for your PRO Portable Water Filters. The LifeStraw Personal Water Filter is one of the most popular portable safety devices on the market today. Extremely light, extremely compact and extremely effective the LifeStraw has been producing clean, safe drinking water for hikers, campers, skiers and those beset by natural disaster for years. 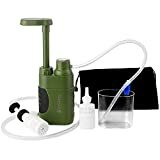 Their 3 piece personal water filter pack is a must for emergency preparedness kits as well as for those heading into the great outdoors with family and friends. Removes 99.9% of waterborne bacteria. Produces up to 1,000 gallons of safe drinking water. Weighs a tiny 2 oz. When you dip your LifeStraw into water just taken from a mountain stream or pond the 0.1 micron wide pores filter out everything from giardia, e-coli, cryptosporidium oocysts and more. It also ensures lead, chromium, zinc and other hazardous metals that infiltrate water via air pollution don’t find their way into your system. There’s no magic here. Only a tried and true method of safely filtering hazards from your water. Take the 3 pack with you on your next family outing and rest easy. 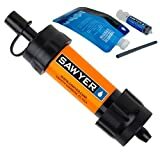 The Sawyer Products MINI Water Filtration System makes it incredibly easy to obtain the safe drinking water you need when you’re on the trail, in the campground or during a natural disaster. The idea behind the MINI is delightfully simple: just screw the filter onto the top of the included drinking bladder or onto any standard size water bottle and drink up. The MINI removes any bacteria, protozoa, harsh chemicals or oversized sediment in the water and you get a refreshing break without having to set up your stove to boil water. Removes more than 99.9% of waterborne bacteria. Filters heavy metals and harsh chemicals from your water. Attaches easily and firmly to any standard water bottle. E-coli, salmonella and especially giardia are all common in much of the world’s “fresh” water today. The Sawyer MINI Water Filter will provide you a rock-solid first line of defense against waterborne bacteria, protozoa and toxic chemicals and the filter itself is small enough to fit in the palm of your hand. Don’t take chances when you head into the wilderness. Take the MINI Sawyer Water Filter instead. 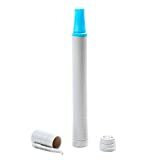 The last item on our list of best water filters for hiking is the Survivor 0.05 Micron Portable Water Filter. The Survivor is a classic straw type filter that’s a bit more robust than some other, similar devices. As such it allows you to take a slightly larger draw when you stop to rehydrate. It’s very well built, very durable and practical as can be. You can place it into the water in your drinking cup or you can dip the end directly into that mountain stream and replenish yourself. With the Survivor you have drinking water wherever you have water. Removes 99.9% of all waterborne bacteria. Can be carried in your pocket for instant access. Weighs a mere 3.5 oz. Finding pure, safe drinking water in the wilderness used to be a fairly straightforward proposition. Today, however, we need to protect ourselves from all manner of waterborne parasites, chemicals and more. The Survivor 0.05 Micron Portable Water Filter will quickly become your best friend on the trail or at the campsite. But even more than that, it’s a must have component of any natural disaster survival kit. A high quality, portable water filtration system can be the difference between an enjoyable day in the wild and a survival situation. Parasites and bacteria are capable of producing disabling cramps and diarrhea that will also make any dehydration you were already experiencing far worse. Every experienced hiker understands the importance of having enough clean drinking water but it’s just not always practical to tote all you need into the wild with you. Any of the above profiled water filtration devices will protect you, your fellow hikers and loved ones from the microscopic enemies that lurk in seemingly idyllic water sources. In addition, should you fall victim to a natural disaster you and your family will be assured that any water you are able to find will be safe to drink.